Today, we are excited to introduce the limited public preview of Azure Premium Files, the high-performance file service for enterprise applications in the cloud. Azure Premium Files provides fully managed file services, optimized to deliver consistent performance at 100x improvement over the existing Azure Files. It is designed for IO intensive enterprise workloads that require high throughput and a single digit millisecond latency. With the introduction of Premium Files, Azure now offers you a choice for two types of shared files storage to fit your workload needs – Premium and Standard. Premium Files, our new offering, stores data on the latest Solid-State Drives (SSDs), which makes it suitable for wide variety of workloads like file services, databases, web infrastructure, content and collaboration repositories, analytics, home directories, high variable and batch workloads, among many others. Standard Files, our existing offering, is designed to provide reliable performance for general purpose file storage, development/test, and application workloads that are less sensitive to performance variability. Performance - on your terms! You define and get the performance characteristics your workload desires! Premium Files offers a way for you to customize file shares to scale IOPS and throughput based on the provisioned capacity to fit your workload performance characteristics without compromising latency. As compared to the current file shares, premium shares can massively scale IOPS by a factor of 100x and targets throughput up to 5 GiB/s, which is 85x improvements. Premium Files offers the best out of the box experience. All the shares, regardless of the provisioned capacity, get a baseline throughput of 100 MiB/s. For each GiB provisioned, the shares get 1 baseline IOPS and 0.1MiB/s throughput up to the maximum allowed limits. Premium Files also offers the ability to operate in a burst mode, which is suited for highly variable and batch workloads requiring short periods of intense IOPS. Let’s look at how the burst mode works. Any unused baseline IOs are accrued in the burst credit bucket. Shares can burst up to 3x their baseline IOPS if there are enough IO credits accrued. On a best effort basis, all shares can burst up to 3 IOPS per provisioned GiB for up to 60 minutes and shares larger than 50 TiB can go over 60 minutes duration. *Premium Files limited preview: IOPS and throughput numbers can vary based on the access patterns. The baseline rates, burst credit, and burst duration are subject to change at the time of general availability. The max scale limits are based off the shares scale with a large capacity of up to100 TiB. Shares sizes are mutable. You can change the capacity of shares and shares will shrink and grow to fit your demand. The current limited public preview of Premium Files supports the scale limits up to 5 TiB shares. With the preview of larger and high scale Azure File shares, Premium Files shares will also increase its 5 TiB capacity limits to 100 TiB. Complete larger and higher scale file shares preview request form to join the preview waitlist. We have an overwhelming interest in this feature, we will contact you once preview is available for you to try. You just pay a per GiB cost. No transactions cost. No additional cost for throughput and IOPS bursting. For IO intensive workloads, you can save money by moving to the unlimited transactions model. With in-built bursting capability, Premium Files removes the need to over-provision capacity to adjust for workloads requiring short periods of high IOPS. Refer to the pricing page for additional details. Currently, Azure Premium Files is available for limited public preview. To sign up for the preview, complete the Premium Preview sign-up survey. 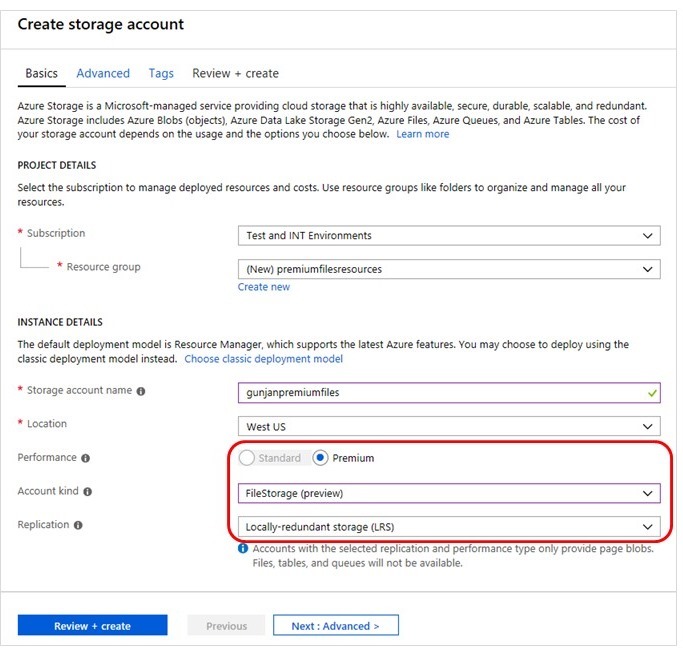 Using your approved subscription, create a new Premium Files storage account - select Premium as the Performance, FileStorage (preview) as the Account kind, and Locally-redundant storage (LRS) as the Replication.